Might as well tell my readers that this post has nothing to do with Costa Rica other than being of mild interest to anyone who wonders what I do when I am NOT working or giving tours. 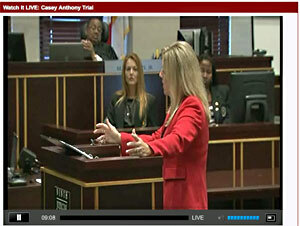 Hint: I am a closet criminal trial watcher, and today is the first day of the Casey Anthony murder trial. I am blogging in one window while listening and watching opening arguments in another! Now I realize there will be readers who 1. Care only about Costa Rica goings on and/or 2. Have zero interest in the Anthony trial. I respect that, so for those of you who fall into either of those groups… Ya’ll have a great day! At least you know that with a decent Internet connection, you can keep up with the dramas from up North! Besides, criminal trials in Costa Rice almost never have a jury but are instead heard by a judge or panel of judges. However… For those who ARE interested in this topic, read on! It’s not long.